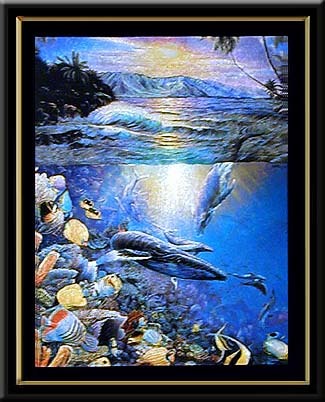 We bring you "Island Enchantment," a magnificent artwork! I can think of few things more enchanting than a gorgeous island reef and its gentle inhabitants. One can loose themselves in this peaceful scene even more easily with the dimension and light of "Magic Effects." With a hectic schedule, give yourself a treat and make some time to get lost in the enchantment of this Christian Riese Lassen piece. "Magic Effects," a process of metal etching technique, was first created at the turn of the century by the celebrated Parisian artist/inventor, Louis Dufay. Mr. Dufay took his fascination with the shimmering iridescence of butterfly wings and turned in into an art form that has luminous metallic splendor. The secret technique that he developed to create this art has been refined as it had been passed down through the generations and we now offer its mystery from Paris to you. "Magic Effects" Art has a changing quality that is caused by the absorption of light. Throughout the day you will notice a subtle variance that occurs with the natural course of each day's light. This change will keep you enchanted day after day. Firelight and candlelight will also have a magical effect on this beautiful art work. Whether it is your first piece or one of many in your personal collection, it will bring you and your family a lifetime of pleasure. Care: This is an exceptionally durable work of art when offered the minimal courtesy. Therefore, please do not expose this art form to unusual heat. For example; do not transport it in the trunk of your car on hot days or display it in an area that receives direct sunlight. Framed Size: 10 inches H. x 8 inches W.
Hurry! Only 5 of this item is left in stock!